There is a large metal box in your kitchen that (hopefully) doesn’t get hot or wet. As it so happens, this large food storage container also allows for storage on the outside. 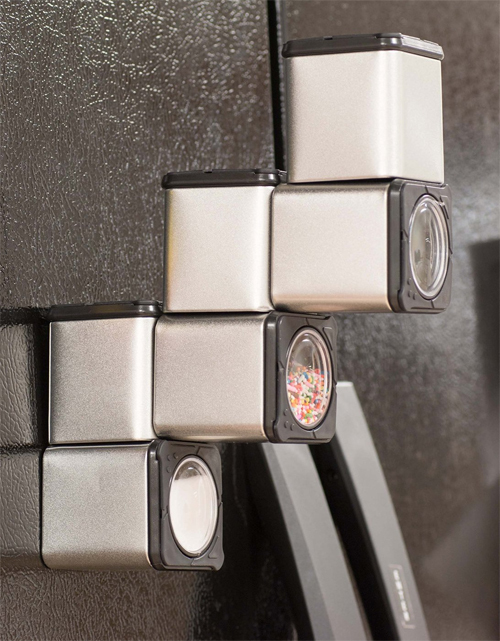 Yup, it’s the fridge we’re talking about here and magnetic spice jars to decorate its surface. The Good Cooking Magnetic Spice Jars are an affordable spice storage solution. The little dispensers are mostly made of metal, so they do stick to each other as well as to the side of the fridge. Each one has a see-through lid and openings for pouring or shaking. When it comes time to use, just pluck one off of the refrigerator door and shake — assuming that one hasn’t been playing Tetris on the fridge and the one you want to use is buried at the bottom of a shape avalanche.